FER - (Title page) Troisieme Partie de L'Introduction a la Fortification. . .
FER, N de / MORTIER, P. - (Title page) Troisieme Partie de L'Introduction a la Fortification. . .
(Title page) Troisieme Partie de L'Introduction a la Fortification. . . - FER, N de / MORTIER, P.
Title : (Title page) Troisieme Partie de L'Introduction a la Fortification. . ..
Map maker : FER, N de / MORTIER, P.. Size : 8.9 x 11.4 inches. / 22.5 x 29.0 cm. Description :Very decorative title page from the Amsterdam edition of ca. 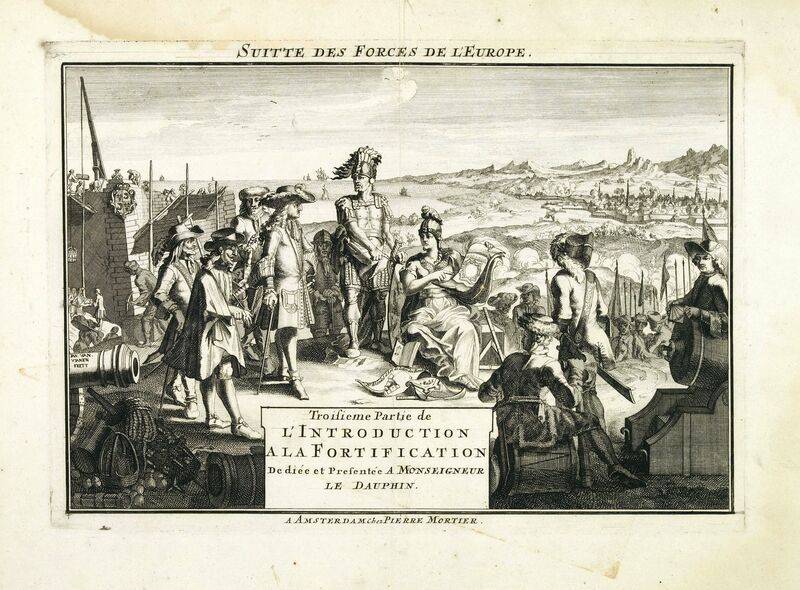 1702 by Pieter Mortier (1661-1711) of de Fer's important work "Les forces de l' Europe." This plate is to the third part and is a remake by J. van Vianen of the original engraved title with the imprint: a Amsterdam chez Pierre Mortier. Nicolas de Fer (1646-1720) was a cartographer, engraver and publisher who issued altogether more than 600 separate maps, including atlases, sheet maps and large wall maps. He gained a great reputation in his lifetime and was appointed 'Geographer to the King' in 1690. This famous atlas, originally published in 1690-1695 by Nicolas de Fer in Paris in 8 parts with 184 plates under the title: ''Les forces de l' Europe". All the plates of this work by Le Fer were carefully copied and edited in ca. 1702 by the well-known Amsterdam publisher of maps and plans Pieter Mortier under a slightly altered title in 12 parts. The plates follow the originals so close that it is sometimes very difficult to see the differences. Pastoureau, Les atlas français XVIe-XVIIe siècles, pp. 203-13. Phillips, pp. 256-7 (other ed.). Tooley, Dictionary of mapmakers, p. 206. Muller, Ned. Historieplaten 3034. Condition : Very light marginal water staining, not affecting engraved area. Very good and dark impression.